I’ve been wanting to talk about fashion for a long time and I kind of waited for the right occasion to set this blog up. As a result of my recent commission for a new book with Macmillan (101 Uses For A Dead Meerkat, out in September 2011), I decided I should deploy part of the advance fee to my first ever proper shopping spree. I decided that after much work-related struggle in the past, I finally deserved it. And £1,000 aren’t that much, are they? After spending three solid months on drawings 101 cartoons about dead meerkats used as loo-roll holders, bras and nanny-cams, I thought that a mere £10 per cartoon wasn’t a bad price after all. So there I was, a couple of weeks ago, having delivered all the material for the book to my editor, going out on a two-day shopping binge. And although I did nip in to high street stores and bought the occasional item there too, I made the executive decision that I’d get myself some proper full-fat designery stuff for the first time. 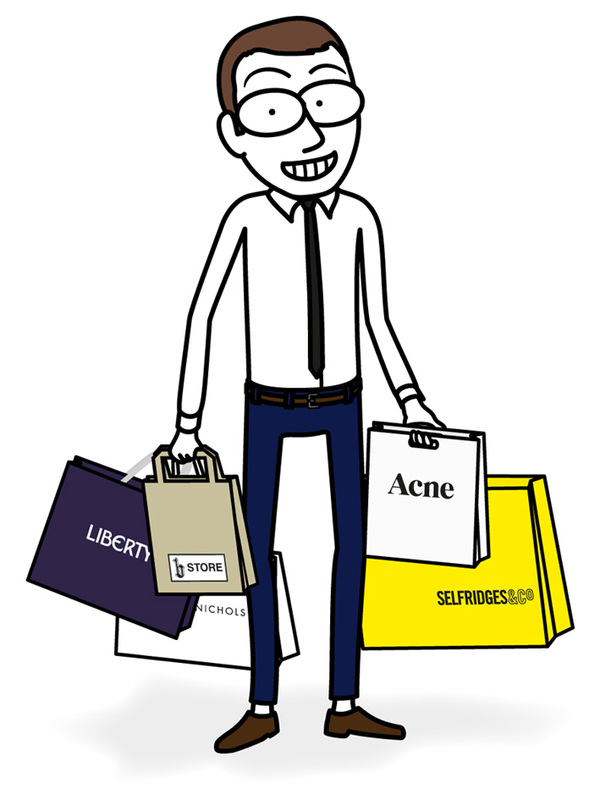 When W, my partner, saw me coming home on the evening of the first day, struggling to carry bags from Selfridges, Harvey Nichols and Liberty, his face was a mixture of unavoidable amusement, honest pleasure for my obvious and evident glee, and understandable apprehension. In fact, I haven’t even spent my whole budget as one of the very few specific items I had in my shopping list (yes, this time I even jotted down a shopping list, just replacing ‘soya yogurts’ and ‘toothpaste’ with ‘cashmere cardigan’ and ‘patent leather shoes’) was a proper raincoat which I couldn’t find (but that’s a subject for another blog). But I really loved it and it felt like a sort of “baptism of fashion”. So here I am, about £600 worse off, but with some A-MA-ZING new pieces in my wardrobe and jaw-dropping bargains (Etro shirt for £50, anybody?!?) and the perfect excuse to kickstart this blog, where I’m going to draw and tell what I like to wear, what I would like to wear, what other people wear… anything fashion-related that will capture my fancy and I will deem worth of a sketch and a few lines.